The Story: Set in Hiroshima during World War II, an eighteen-year-old girl gets married and now has to prepare food for her family despite the rationing and lack of supplies. As she struggles with the daily loss of life's amenities she still has to maintain the will to live. World War II has provided so many stories of heroism, loss, war, love, brotherhood, family, and just about everything else in between. Before watching this movie, I honestly had never really thought about how the war and the dropping of nuclear bombs would have impacted the lives of every day people in the areas surrounding Hiroshima and Nagasaki. 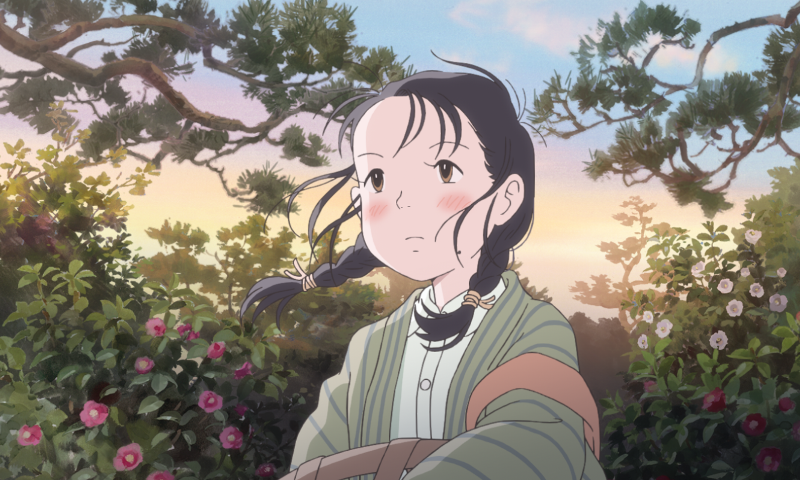 Sunao Katabuchi's movie, which he adapted from a manga created by Fumiyo Kono, covers this ground nicely by introducing us to young Suzu (voiced by Rena Nōnen aka Non), who has struggles of her own to deal with while the war looms just over the hills and in the nearby waters. 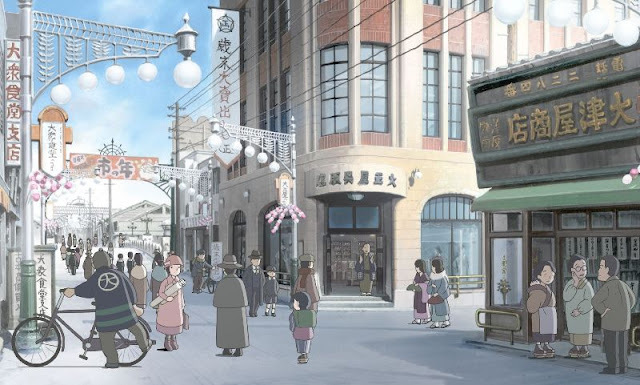 To get things right and to honor the people and places of the time, Katabuchi did extensive research on each of the locations in the film. Every town had to be painstakingly recreated for accuracy which was no easy task considering how the devastation of war and atomic bombs literally changed the landscape and flattened whole towns. Kono's original artwork was a great source material to draw from, especially when it came to Hiroshima itself as she had placed her characters in very specific and very important locations to tell the story. Suzu's perseverance is inspiring and she embodies the spirit of the people around her. She is thoughtful, artistic, caring, and loyal although a little absent minded at times which helps to add a bit of comic relief here and there. Katabuchi's art direction is stunningly beautiful and, having seen first hand some of the amazing landscapes Japan has to offer, I feel like the hand drawn animation is absolutely spot on perfect. There are also moments here and there where the artwork goes a little chaotic or abstract which is meant to mirror the intensity and each one puts you right into Suzu's head to enhance the emotions she is feeling. While CGI is flashier and is very useful when it comes to putting epic moments on screen, I would say that the choice to use hand drawn animation to tell this story was absolutely the right move and it feels very appropriate to honor and remember such an important time in Japanese history. For me, it was important to understand and learn about something I have only ever seen from the other side of the war and I was very impressed with the great care and detail that went into every frame of the movie. 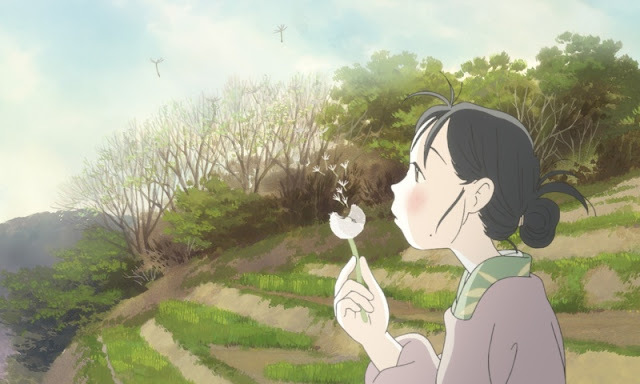 In This Corner of the World is an important work of art that tells a beautiful story of courage, love, and perseverance. 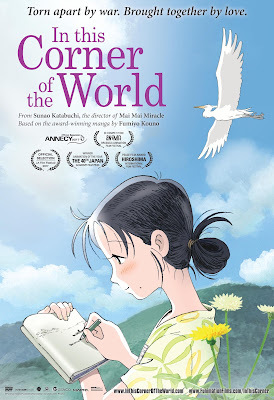 Definitely a must see whether you are a fan of animation, Japanese history, or you just love watching great movies. Added bonus: As a long time fan of the Space Battleship Yamato animated films, it was fun to see the original Yamato battleship sailing in the waters of Hiroshima Bay. After seeing how it was such a symbol of strength and pride for Japan during World War II, I understand even more why it was resurrected and rebuilt to save the world.